We saw our first Western together, Rio Bravo with John Wayne, at the Cinema Park, across the street from my favorite bookstore. I remember begging Baba [Amir’s father] to take us to Iran so we could meet John Wayne. Baba burst out in gales of his deep-throated laughter – a sound not unlike a truck engine revving up – and, when he could talk again, explained to us the concept of voice dubbing. Hassan and I were stunned. Dazed. John Wayne didn’t really speak Farsi and he wasn’t Iranian! He was American, just like the friendly, longhaired men and women we always saw hanging around in Kabul, dressed in their tattered, brightly colored shirts. We saw Rio Bravo three times, but we saw our favorite Western, The Magnificent Seven, thirteen times. With each viewing, we cried at the end when the Mexican kids buried Charles Bronson – who, as it turned out, wasn’t Iranian either. Overall, this book seemed to me like a cross between Harry Potter and Dan Brown. While I have some liking for the Harry Potter books, they’re by no means great literature; where Dan Brown is concerned, I agree with Stephen Fry’s description of The Da Vinci Code as ‘complete loose stool water, arse gravy of the worst kind’. To be fair, Patrick Rothfuss has a little more talent for writing than Dan Brown, but he doesn’t have the knack of writing an exciting story. The book can be separated into two alternating parts. It begins as a third person narrative, focusing on ‘Kote’ an innkeeper. But he is tracked down by a scribe who is looking for the legendary hero Kvothe. Supposedly reluctantly, but, as it appears on the page, all too readily, Kote admits that he is Kvothe and agrees to tell his story, but only if he can do it properly, which he estimate will take three days. The second part of the book is that story, a first person narrative of everything that has ever happened to Kvothe since he was a boy. It details his upbringing as a travelling minstrel, his education from his goody-goody parents and a convenient wandering ‘arcanist’ (magic-user), the murder of his parents by some mysterious beings (and his convenient escape from a similar fate), his trials as a homeless boy in Tarbean, a hive of scum and villainy, his entrance to Hogwarts – I mean the University, his convenient rise from first year to the equivalent of a PhD student in the space of a few months. The whole thing is pretty tedious and annoying and lots of it make no sense. Kvothe is supposedly a worldly-wise child prodigy, but he lacks the presence of mind to find himself a part-time job. Another annoyance is Kvothe’s repetition of the expression ‘If you’ve never experienced x then you can’t hope to understand.’ It crops up about half a dozen times and gets more annoying and patronising every time. One of the things the reader can’t hope to understand is the attraction of Kvothe’s female friend, Denna. I don’t understand the attraction. She’s pretty annoying. There’s also something dodgy about her which is hinted at in the book, but isn’t revealed. Despite his vast intelligence, immense charisma, wonderful good luck etc etc, he’s never so much as kissed a woman by the end of the book (I mean by the end of the story within the story) – which allows the author to turn Kvothe’s blindspot towards Denna’s suspicious behaviour. Near the end of Kvothe’s narrative, the two of them team up for an adventure regarding a dragon (the dragon is pretty interesting and original, and still fairly daft – it’s a vegetarian: it eats trees; it sets them on fire, rolls on them to put them out then scoffs the wreckage). This episode reminded me of the American guy and the French woman in The Da Vinci Code: one of them has a good idea then gets stumped; then it’s the other’s turn for a good idea before getting stumped; repeat ad nauseam. 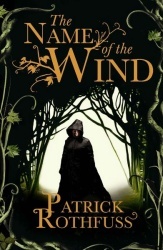 In The Name of the Wind it’s not quite so unpleasantly clunky as Dan Brown’s effort. But then there is the moment when Denna tries to eat a mysterious substance, which turns out to be a famously potent, opium-like drug. And the reader is supposed to respect her. The translation from American to British English is patchy. Trousers are referred to as ‘trousers’ in one place and as ‘pants’ in another. As you know, many words that are spelt ‘-our’ in British English lose their ‘u’ in American. The word ‘tremor’ is spelt the same in both versions, though. Except in The Name of the Wind, that is. I don’t which is worse: the idea that the British editor just did a find and replace job for ‘or’, or erroneously changed the spelling of that word. Despite all its tedious and pointless effort to set down every single event of note in Kvothe early life, the book retains a certain readability. The narrative drags terribly early on, but gains a little momentum towards the end. The structure of the book, swtiching back and forth between third person and first person story within a story, deserves some kudos, but like much of the book seems quite pointless, done only to appear clever. The characters, scenario, plot and writing are all completely stock, all the interesting events are well-insulated by large chunks of exposition, infodump and lame attempts at characterisation, scene-setting and self-conscious cleverness. I find it baffling and annoying that this book seems to be so well-received. As of right now, I’ve been to four taekwondo classes since I started again. After having a lot of pain in my legs, from overstretched hamstrings and bruised shins, I’m feeling OK now. The classes are pretty good. After warming up, there’s a good and varied amount of training – of the kind I mentioned last time. I’m having a few minor doubts, though. There’s only one teacher – and for the Koreans this is no problem because the class isn’t that big. But for me it means that the sabeomnim can’t take time out to help me without neglecting the others. At my previous dojang there were often as many as four sabeomnims training the students. My pre-taekwondo writing didn’t go well too well on Thursday (Friday was a national holiday – Buddha’s birthday). I was too tired to concentrate – I was falling asleep. I got a little bit of work done on my current story before I knocked it on the head. Then I went home and shared a private moment with Habiba. If you know what I mean. And I’m sure that you do. The story I mentioned is now up to about 3,500 words and is shaping up to be pretty much what I wanted it to be (which doesn’t always happen). It will take a lot more work before it’s finished, though. I might have a first draft done in two or three weeks. Yesterday, as I mentioned, was a public holiday, so Habiba and I along with Ksan went to a beach near Incheon Airport – Eulwangni Beach. The airport is on an island to the west of Seoul. I went to a similar place about a year and half ago with Botond. It was nice. The weather was hot, although hazy and gradually increasingly overcast; the breeze off the Yellow Sea (which Koreans call the West Sea) was cool. We just sat on sheets on the sand along with hundreds of other people and picnicked on cucumber, nuts and chocolate. We played some Uno, read, chatted. At one point Habiba and I took a walk to the receding waterline where we found that the water was surprisingly chilly. Only a few kids braved the gentle waves. As Bo and I had done in 2008, we caught a bus to the airport, had a coffee there and took the airport railroad home. It’s a bit slower than taking an express bus, but only about half the price. In political news, the new Con-Lib government is bedding down. Nick Clegg is the Deputy Prime Minister – which is regarded as something of a joke position. If I remember rightly, the post was created for John Prescott, himself one of the most severely satirised politicians of the New Labour era. But Nick Clegg has some big tasks on his plate, especially from a Liberal Democrat point of view – reform of the whole political system. If the coalition government survives, he’s going to bring in legislation for a referendum on changing the voting system, reducing the number of MPs, having fixed term parliaments, introducing a wholly or partly elected House of Lords. It’s an exciting time to be a Liberal Democrat, but also a very dangerous one. If the coalition breaks down, forcing a new election – perhaps because Lib Dems can’t support certain Conservative policies – Lib Dems may well be punished. We might not even see any progress at all towards that totem of Lib Dem ideology, proportional representation. Lots of Tories and Labour MPs don’t want any change, and the only new system that is on offer is one that Lib Dems don’t like. That said, the signs seem pretty good so far. David Cameron are the same age and have the same background. A lot has been said about how the two parties share the same economically liberal ideas. Cameron has been talking about bringing in a new style of politics. It certainly seems like the leadership of both parties are in earnest about making the deal work. There will be problems, I’m sure, some of them big ones – but hopefully not dealbreakers. The next few years should be interesting. I’ll have to make more effort to get my vote in next time round, especially for any referendum on electoral change. After a few weeks of thinking about it, I finally started going to taekwondo classes again last week. I stopped going to taekwondo last year when I lost my job and moved in with Habiba. In the ten months or so that I’d attended up in Nowon I got up to blue belt. It was good exercise, but I never really felt that I was becoming proficient in self-defence (if I really wanted to do that I should have done hapkido instead). Early last week, I promised to look round our area here in Sangwangshimni to look for a dojang, but it was Habiba’s friend Jade who found me a place to train – a choice of places to train, in fact. On Wednesday, I went along to Dongmyeong Cheyukgwan to sign up for classes. They run five days a week, but I’m only going to do three – from 9:30 to 10:30 on Tuesdays, Thursdays and Fridays. The Gwanjangnim – master – doesn’t speak any English (to speak of), but I talked to him in my limited, halting Korean and managed to tell him a bit about myself and my experience. The following day, I packed my dobok – uniform – before I left for work. When I finished work, I went to a restaurant near EducaKorea for dinner, then to Starbucks to do some writing (I have a new short story I’m working on and I’m trying to put in a fair bit of work on it – with my taekwondo classes starting at 9:30, I have a good excuse to put in an hour or so at least three times a week), then headed towards home for taekwondo. The first class went pretty well. We did some warming up first – not as much as I used to do in Nowon – then some more formal exercises where you kick, kick, kick your way across the training hall and then back, then more kicking practice – this time with the teacher – sabeomnim – holding these kind of tennis racquet-shaped pads for you to strike. One of the more interesting of these latter exercises was running at a padded section of wall, jumping on to it, kicking off with one foot and then kicking the pad held by the sabeomnim, who is standing to one side. Towards the end of the class, I was given instruction in how to straighten my dobok. I didn’t really understand what was going on at first, but it was evidently just a bit of humour. First you pull up your collar, then tug the bottom of your dobok top in various ways; the procedure ends with pulling your belt tight. The sabeomnim has a very deep, raspy voice; he sounds like he’s been up screaming all night. He doesn’t speak any English, either, but I have a translator – a young guy whose English name is Gabriel (pronounced with a short a sound). He speaks near-perfect English and told me that he’d studied golf in the Philippines for a year and was planning to study taekwondo at university in Australia. For the moment, he doesn’t do anything so he has lots of time to practise. The dojang isn’t nearly as big as the one in Nowon – probably less than half the size – so there are much fewer students – sixteen, tops. The day after my first class, my hamstrings were very uncomfortable – I had a small stab of pain every step I took. In Friday’s class, we started off with some football as our warm-up exercise and later did quite a lot of sparring. This was a bit intimidating – with one exception besides myself, all the other students are black belts, and I’m sure I’ve regressed a lot since attaining blue belt – but it was also not too difficult. The other students were a little bit scared by me, I think (they’re mostly children with only one or two others as old as Gabriel (18 or 20)) so they certainly weren’t laying into me or anything. We were wearing chest pads, so there was little risk of injury in that area. However, the next day, I felt some fierce aftereffects. In addition to my stiff hamstrings, I now had some painful bruises on my shins. Walking was really quite difficult. It’s now Sunday and I’m still feeling creaky and uncomfortable. Hopefully, things will be a little better when I return on Tuesday. On the other hand, I seem to remember that my hamstrings hurt for a couple of weeks when I first started doing taekwondo. I’m sure it’s all for the best. A few weeks ago I sent off to register as an overseas voter with the local council in Britain where I was last registered to vote – Camden. I got an e-mail from an elections officer saying I should register to vote by proxy because there probably wouldn’t be enough time for me to return to my vote. I e-mailed a couple of people I know in the Liberal Democrats to ask if they could find someone to vote for me. I didn’t push too hard, and nothing came of it. My postal vote arrived a day after the election. It wouldn’t have made much difference, as the Lib Dem candidate in my constituency was up against Frank Dobson and he won comfortably. I got up extra early on Friday morning to start listening to the election coverage on Radio 4. As I proofread at work, I listened to the results coming in. I rather selfishly refused to go out to look at potential new textbooks with my colleagues at lunchtime. What a disappointing and fascinating night. Despite the boost in the polls as a result of Cleggmania, the Lib Dem vote only went up by 1% – and we lost a handful of seats, ending up with 57 MPs. 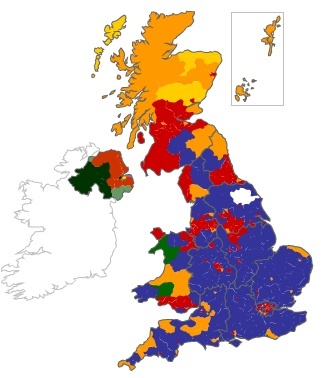 The Conservatives ended up the biggest party in Parliament with 306 seats, while Labour got 258. The Green Party got its very first MP – no mean feat in the UK electoral system. In the council elections, Labour actually did pretty well, albeit from a very low base. In my hometown, Runcorn – which is covered by the constituency of Halton, the Lib Dems lost one seat, going down to 13, and the Conservatives lost three, going down to six, handing Labour an even more comfortable hold on the council. In Camden, where I lived in London, Labour gained control where previously there had been a minority Lib Dem administration. The Liberal Democrats now have a difficult choice to make. Both Conservatives and Labour are making moves to get into bed with us – or at least into a casual relationship. The Lib Dems essentially now have the power to decide who will be the next prime minister, or at least which party will form the next administration. There are complex benefits and disadvantages to gauge. The Conservatives have the strongest claim to be the next government, but their ethos is antithetical to many Lib Dems – liberalism and conservatism go together like oil and water. They are also against electoral reform – an issue of talismanic importance to Lib Dems. Labour on the other hand, while they didn’t do disastrously badly on Thursday night, have lost the confidence of many of the voters who put them into power in 97, 01 and 05. I think most people would rather not have another Labour government. On the other hand, by constitutional convention, they have the right to be the first to try to form the next administration – they are also much closer philosophically to the Liberal Democrats, and before the election they had planned to introduce legislation to reform the voting system. Besides all of this, there may well be another election within the year – and those voters who came to the Lib Dem cause this time around may desert us for one of the larger parties just to try to get a more decisive result. Right now may be the only chance we have for a generation to get electoral reform. If proportional representation were introduced before the next election we could end up with three times as many seats. But if the Lib Dems are seen to be making deals for selfish electoral advantage it could count against them. For someone of my age, a hung parliament is terra incognita – something that only happened in the past or in other countries. It must be a huge challenge to the politicians, who have to change their whole way of thinking about elections and representation. All the signs seem to indicate that a deal of some sort will be hammered out sooner rather than later. We’ll just have to see what it is. This is the second book I’ve read out of three books I bought off an old colleague from E-Castle. It also covers similar material to the first of those books that I read, Freakonomics. 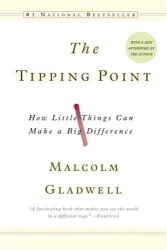 The Tipping Point is about the spread of ideas, how ideas are contagious like diseases, how their spread is facilitated by people with particular talents. A tipping point is the moment at which the spread of an idea tranforms from a low-level outbreak into a growing epidemic. The talented people who help push new ideas beyond the tipping point are divided into three categories by the author: Connectors, Mavens and Salesmen. Connectors have vast numbers of contacts, Mavens keep themselves and others up to date with latest developments, and Salesmen are the passionate extraverts who motivate others. Gladwell illustrates the power of these three types of people with the stoy of Paul Revere, who, when he learnt of the British Army’s plan to attack a rebel American weapon dump at Concord rode through the night to warm people. When the British marched the following day, they were met with resistance. At the same time that Revere made his midnight ride, another early American, William Dawes made a similar journey in a different direction – to very little effect. Gladwell argues that Revere had the contacts, the knowledge and the communication skills to make his message contagious while Dawes didn’t. Other vital elements of the successful spread of an idea are stickiness – how memorable an idea is – and context – how relatively minor details of the environment can make huge changes to people’s behaviour. An experiment involving individuals being sent to another building and passing someone in distress in a recreation of the parable of the good Samaritan showed that the main thing that made a difference to whether the subject stopped to help was whether they were in a hurry or not. The book is fascinating and contains lots of valuable insights into people’s motivation. It sets out a whole new way of looking at some of society’s most difficult problems – it falls short of proposing detailed solutions on the basis of its own message, however. There’s a bit of a mish-mash of evidence quoted – lots of it is anecdotal or based on interviews with examples of Connectors, Mavens and Salesmen; some comes from other books on similar subjects, some is quoted from research. The book is accessible, and has a curious mixture of gravitas and popularism. Definitely worth reading. It was my birthday two days ago and the celebrations went on for two days. Well, the main event was Tuesday night, with a subsidiary event the following day. After work on Tuesday (where I’d already had a little mini birthday party and been given four boxes of teabags and some toner (of the cosmetic rather than printing variety)) I gathered a group of friends – Habiba, of course, Andrew and Seong-hyeon from work, Todd from roleplaying and Aidan and Alicia from Habiba’s work – and went for a meal at a place near Konkuk University with the silly name Bread is Ready, Coffee is Done. I’d been there once before with my friend and colleague Ji-hyeon and thought it was pretty decent and not too expensive. I think the feeling on Tuesday night was that it wasn’t that great. I was happy with my meal, however. After that we embarked on a quest for a bowling alley that had been recommended to us by Zack. He was able to provide me with it’s location on a mapping website, so it was quite straightforward getting there. Once we got there, though, we were told there was a two hour wait for lanes. I had thought about trying to make a reservation, but in the end decided it probably wouldn’t be necessary. We put our names down for lanes and left. After some umming and ahhing, during which time we were joined by Jessica who had a cactus for me, Andrew found us a bar to go to – a place called Bunker Bar. It looked like something from the eighties, but it served drinks (as long as you also bought food – par for the course in Korea) and had a booth where we could push a couple of tables together and enjoy a little privacy. We had beer – some of us soju – and fries and Korean savoury pancake and fruit. June arrived and Ksan and Jun-hong also joined us, bearing a bottle of wine and some flowers stolen from a wedding (which they’d just come from). I was challenged to partake of a Korean tradition where someone who’s birthday it is or is leaving a company or what have you has to down a drink consisting of various things added by the other people. Mine was very tame – mostly beer with some cola, soju and sugary milk from the fruit salad thing – oh, and some parsley, courtesy of Habiba. Then we went bowling – which was lots of fun. There were ten of us sharing two neighbouring lanes. I was using the bathroom when people were assigned teams and I ended up with Andrew, Seong-hyeon, Alicia and Ksan. The first game was very close. Habiba got 96 points, I think, and I got 93. I found my rhythm more in the second game and got the highest score of 132. Andrew wowed everyone by getting four strikes in a row for his last four rolls – but he was coming from a low score of about 60. Eric joined us during the second game – a little too late to play, unfortunately. Once the bowling was done half our number returned to their dwelling while the rest of us went on to a noraebang and sang songs for an hour and a half. Eric and I duetted on a rendition of Limp Bizkit’s ‘Break Stuff’, which is a song that I think is fantastic, but he thinks is terrible. And then we all went to our respective homes. The following day was Iron Man 2. Ten of us got together for this, with me providing the tickets (Seong-uk at work helping me reserved them the following day – the cost has apparently been charged to my phone bill as I lack a Korean credit card). It was good, but not great, in my opinion. It had a lot of great elements, but it all seemed a bit perfunctory, nothing was covered in great depth. Even the highly fit Scarlett Johansson kicking multiple arse did little for me as her character was so unimportant and emotionally flat. Later in the day, wearing the T-shirt Habiba had got me (beardy faces), the love of my life and I went to Itaewon where she pick me up another gift – Sea of Silver Light, the final book in the Otherland series. Then we went for a fancy meal at a restaurant in Itaewon, OK2. The first course consisted of three small, disparate slices of raw fish on a plate with a little garnish. That makes it sound terrible, but it was actually very good. The whole meal consisted of about six courses, of which the fish appetiser was probably the most haute; the heartiest was the fish pasta. My main course was roast duck and not as good as Habiba’s snapper (more fish). It was an interesting and tasty (and pricey – but that’s OK: Habiba paid) meal. All in all, it was a pretty excellent birthday.